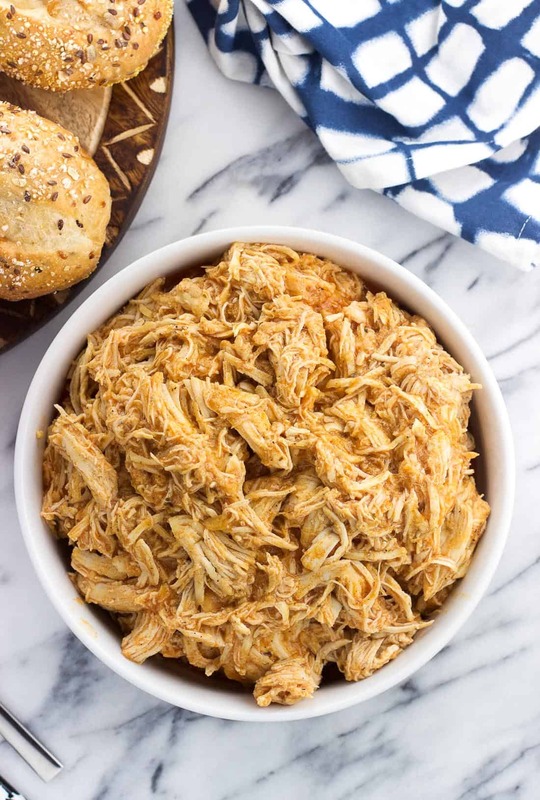 Instant Pot buffalo chicken is an easy and healthy dinner that can be served so many different ways. 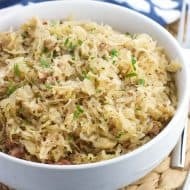 Just add everything to the Instant Pot and cook! This makes a great meal prep recipe. 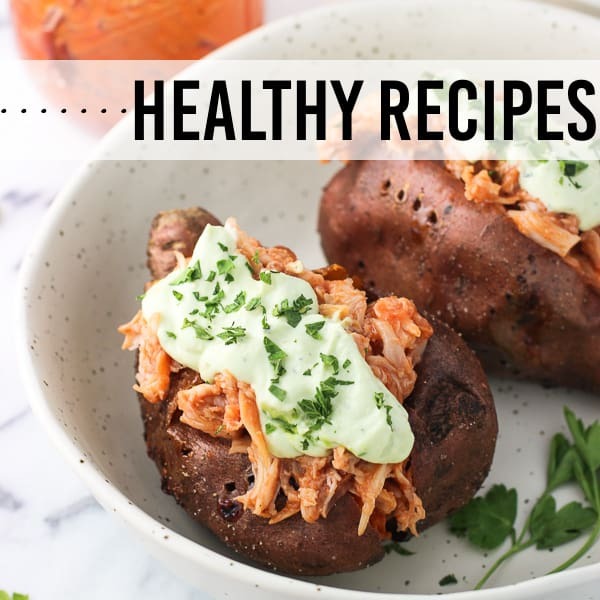 You’d be hard-pressed to maneuver around this blog for more than a few clicks without running into a buffalo chicken recipe. Buffalo chicken is a holy grail of sorts around here with its perfect mix of being filling, just spicy enough, and usually healthy. I say ‘usually’ because there are a few recipes (1, 2) circling around here that show it goes miiiighty fine with melted cheese. But the chicken itself? Healthy. It’s a ‘choose your own adventure’ kind of thing. 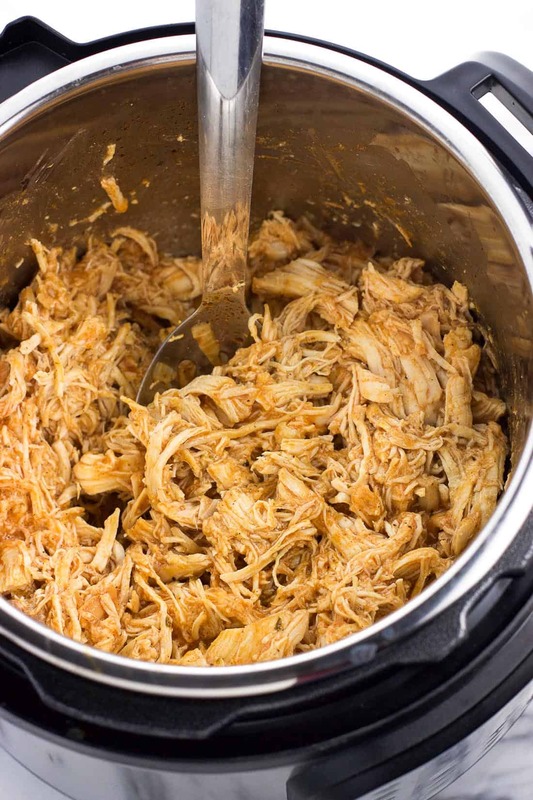 My slow cooker buffalo chicken recipe is one of the most popular ones on this site. It goes crazy on Sundays, which I’m thinking is a mix of football homegaters and meal preppers. A versatile, juicy, and spicy protein, it pairs equally well with pretzel buns for sliders or atop a mixed green salad with allll the veggies. 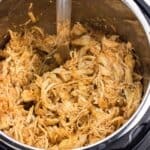 Since I’ve been getting my hands dirty with my Instant Pot, it was only a matter of time before my beloved slow cooker buffalo chicken turned into Instant Pot buffalo chicken. With very similar ingredients, this recipe is just as delicious and takes a fraction of the time – just fifteen minutes of pressure cook time versus a few years hours. ^Okay, ‘years’ instead of ‘hours’ was a typo, but one that made me laugh out loud so I left it. 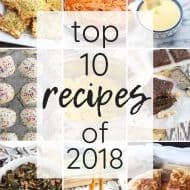 After getting used to the Instant Pot, some slow cooker recipes certainly do feel like they take years! This Instant Pot buffalo chicken is the fourth IP recipe to go live here, with two more in the works. 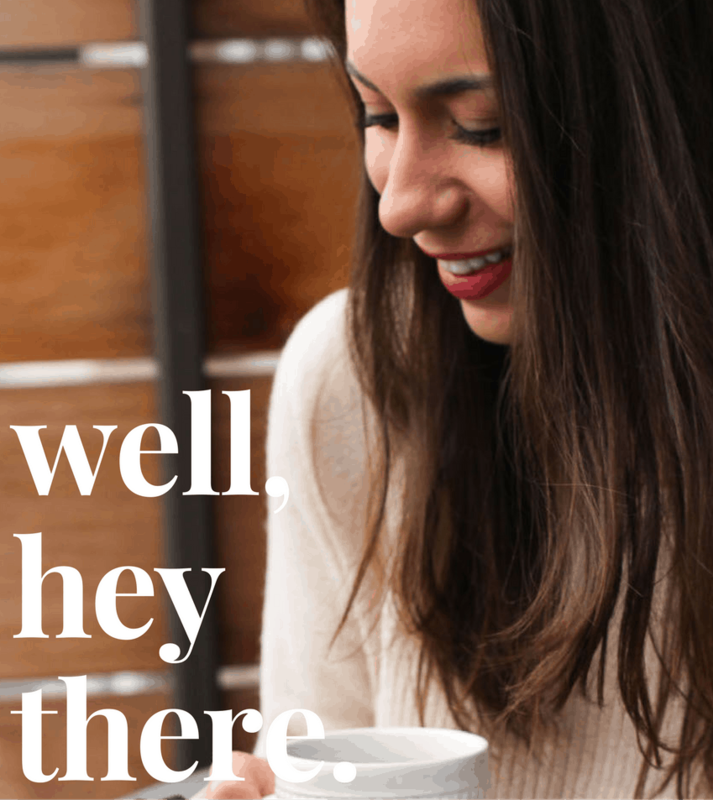 …this one is different as the prep is even easier. 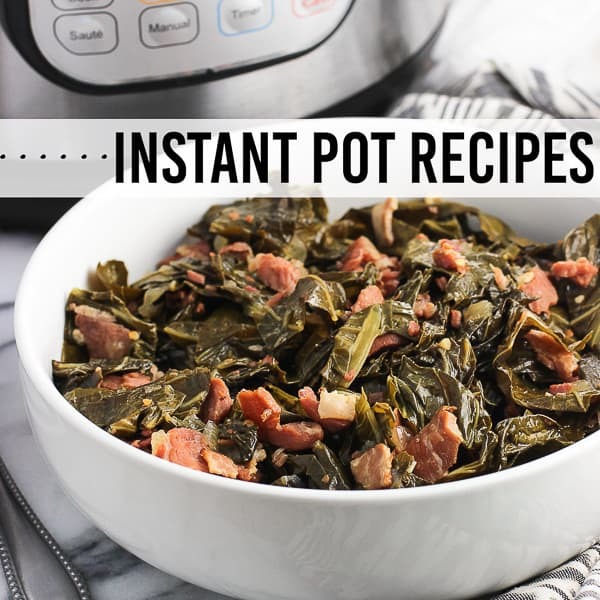 While I love the Instant Pot’s Saute function to efficiently cook ingredients like onions and bacon or to sear meat, we don’t even need it for this one. Everything gets added to the Instant Pot, sealed, and then manually pressure cooked. Simple as that. The boneless skinless chicken breasts are seasoned with a blend of pantry staples such as salt, pepper, garlic powder, parsley, and oregano. You can also use your favorite chicken seasoning or pre-mixed blend if you like, such as Italian seasoning. 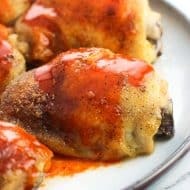 Keep in mind wing sauce will be make up the majority of the liquid ingredients, so your chicken seasoning won’t be the only thing carrying weight as far as flavor goes. Then in goes the diced onion right over top. No sauteing necessary. 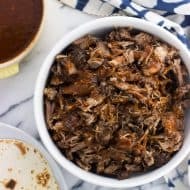 It all but disappears in the dish once the chicken is cooked and shredded, but it adds little hits of juiciness and flavor. The liquid here, which does double duty as a requirement for pressure cooking and a sauce for serving, is made of three things: wing sauce, broth, and vinegar. What buffalo sauce should I use? I love love love FRANK’S REDHOT® Buffalo Wings sauce (not sponsored), which is what I use here and in just about every recipe that calls for buffalo sauce on this site. It adds the perfect amount of spice to a recipe without being too much. Something to keep in mind when choosing a wing sauce is that Frank’s contains zero calories per one tablespoon serving. It’s rather thin, so we like to combine it with a little butter and/or honey when using it to coat chicken wings. Here though, thin is fine. Other brands appear to be thicker and contain more calories (15-20) per tablespoon. Just an FYI for the nutritional info included in the recipe card below, which is calculated as an estimate using Frank’s. One-quarter cup of broth gets added to the mix, along with two tablespoons of apple cider vinegar for a little extra bite. Whisk it together and gently pour over the chicken. Once the chicken is cooked, it’s time to shred. You can do the old “pull apart with two forks” method, but to speed things up I like to use my stand mixer. Using a slotted spoon, transfer the cooked chicken breasts to the bowl of a stand mixer fitted with the paddle attachment. Before I turn the mixer on I always attach the pouring shield or cover the whole thing with a clean kitchen towel. Reason being is that once the mixer starts, hot chicken shreds will start flying. Please do this carefully so you don’t get burned! Once shredded, keep the chicken covered to stay warm while the sauce thickens. You can use your favorite sauce-thickening method here, but I tend to go for a cornstarch slurry. Carefully remove two tablespoons of the cooking liquid and whisk it with two teaspoons of cornstarch in a small bowl. With the Instant Pot on “Saute”, slowly drizzle the slurry into the sauce while whisking and continue to heat until thickened to your liking. Once thickened, add back the chicken and toss to combine. 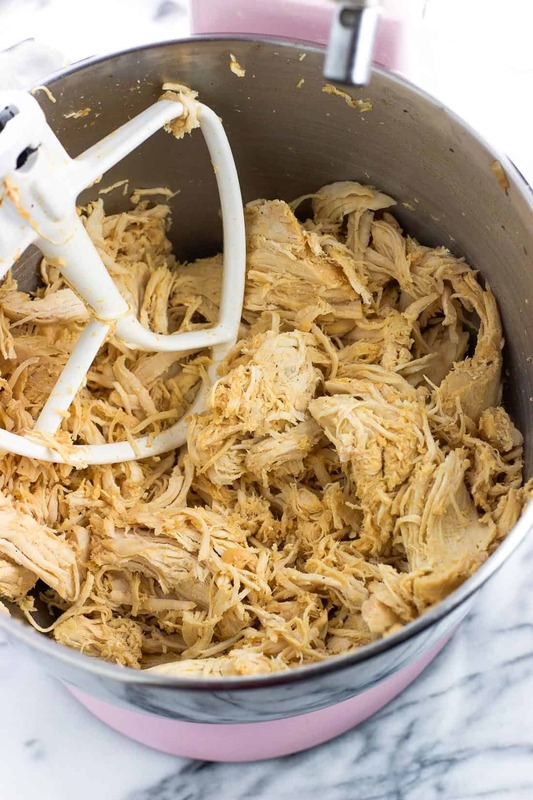 Because this Instant Pot buffalo chicken recipe yields a fair amount of servings, you may want to switch up how you use leftover portions so you don’t get tired of it. I know I do! Here are some delicious recipes that use cooked, shredded buffalo chicken in new ways. Buffalo chicken tortilla pie is always a hit. It’s easy to assemble, and is done in about thirty minutes. Great for weeknights! Who wouldn’t love a buffalo chicken grilled cheese? I have a hard time not making a buffalo chicken kale salad when I have leftover buffalo chicken. The homemade avocado ranch dressing is a treat. Plus this salad is such an easy way to use up leftover fridge odds and ends. 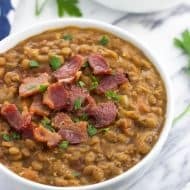 This recipe was tested and cooked in a 6-quart Instant Pot (affiliate link). Since the chicken releases some liquid as it cooks, the one-ish cups of liquid ingredients here should be sufficient as written for the 8-quart IP or any larger pressure cooker. You can always add more wing sauce or broth if you prefer to play it safe. I usually have an open container of broth in the fridge, so that’s what I use for the quarter-cup. You can use water if you’d rather not open a whole container. Be sure to make a cornstarch slurry and whisk it into the thickening sauce versus just adding the cornstarch to the Instant Pot. Cornstarch as a thickening agent needs to be whisked until smooth before adding, otherwise it can clump up and be generally less-than-appealing. In a small bowl, stir together garlic powder, salt, pepper, oregano, and parsley. 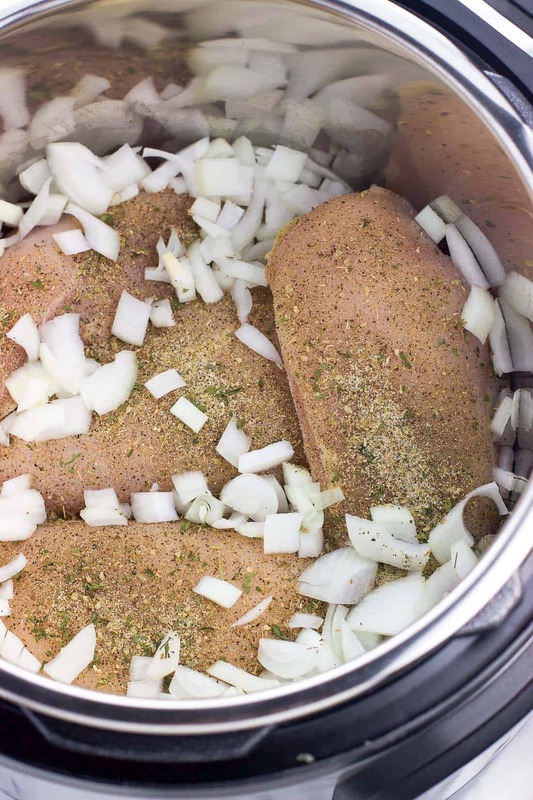 Rub seasoning on both sides of the chicken breasts and place the chicken in the Instant Pot. Add chopped onion to the Instant Pot over the chicken. 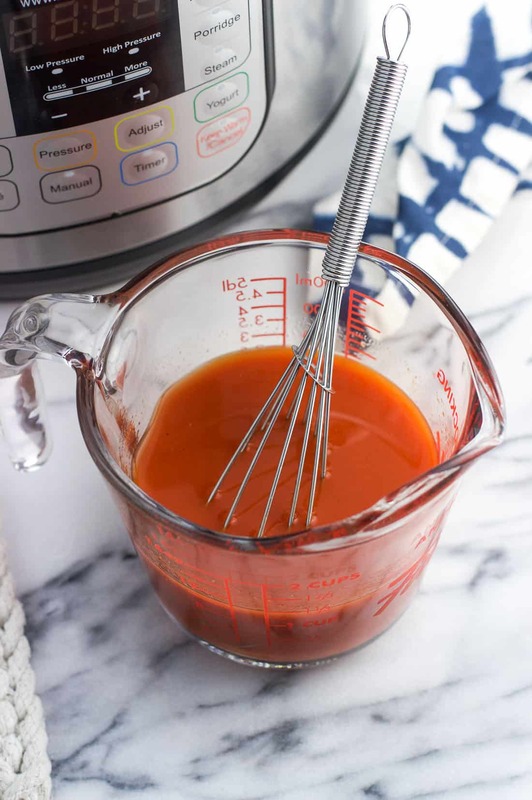 Whisk together buffalo wing sauce, broth, and vinegar. Pour into the Instant Pot over everything. Press the "Manual" button, and then using the "+" or "-" buttons adjust the cook time to 15 minutes. Once the 15 minutes are up, let the pressure release manually for 5 minutes, then carefully turn the knob from "sealing" to "venting" and wait for the float valve to go down. At this point remove the lid, using care as the steam will be hot. Remove the chicken breasts and shred using your preferred method. You can place them on a cutting board and shred using two forks, or use the paddle attachment of a stand mixer (see note in post above). 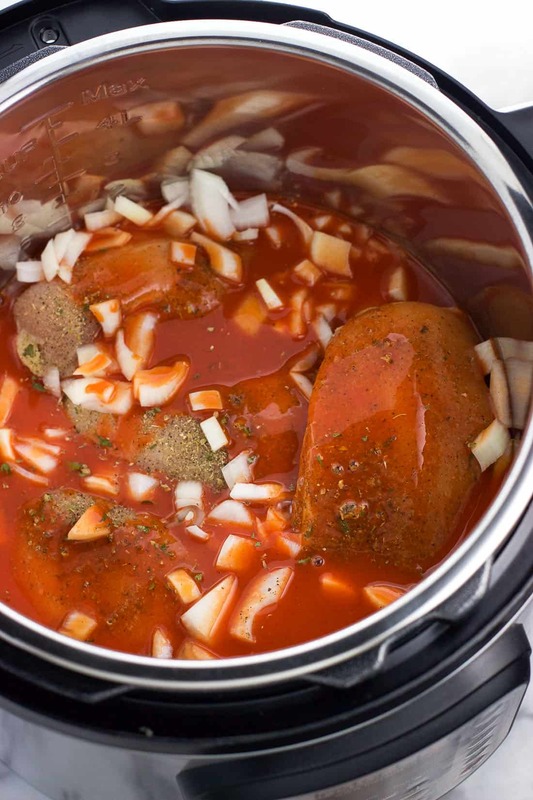 Press the "Saute" button on the Instant Pot to thicken the cooking liquid into a sauce. Remove 2 tbsp of the liquid and add to a small bowl. Add cornstarch and whisk until smooth. Slowly drizzle cornstarch slurry into the Instant Pot while stirring. Stir frequently as the sauce thickens. Once thickened to your liking, add back shredded chicken and stir to coat. 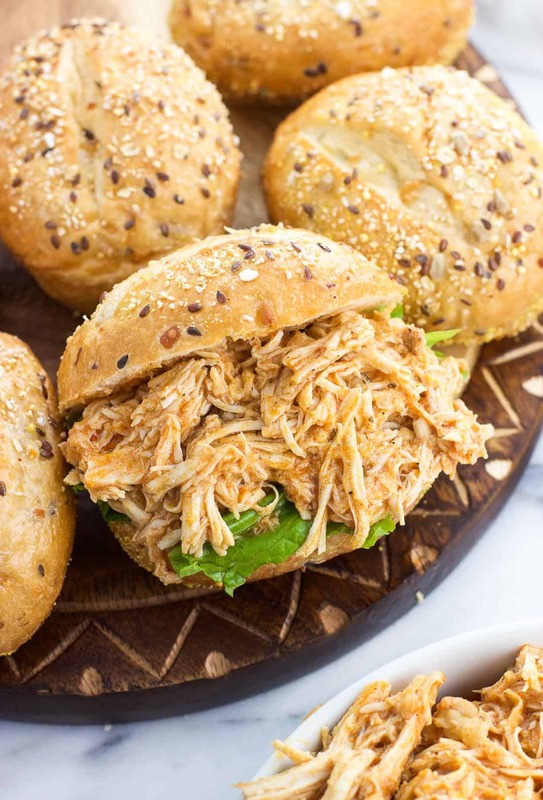 Serve Instant Pot buffalo chicken on salads, sandwiches, tacos, sliders, and more! Inactive time is an estimate of 15 minutes for the Instant Pot to come up to pressure and for the 5 minute natural release at the end. The nutritional info is an estimate for the chicken and sauce and does not include what you might serve it with. This recipe was absolute amazing. I tried it in a quinoa dish, over a salad, in a wrap, and then just started eating it on it’s own because it was so good!! Hi Denis, sorry to hear that. I don’t think omitting the vinegar would have much effect as it’s a small quantity in the cooking liquid. Was the pressure released naturally for longer than 5 minutes before doing a quick release? The longer the pressure releases naturally can sometimes overcook the food. Otherwise you may need to decrease the cook time by a minute or two in the future. Less likely but still possible is that the chicken experienced “woody breast”, which can cause chewy/tough meat no matter what. I’ve noticed on occasion that chicken breasts I buy and use in recipes I make very frequently can sometimes just be chewier than normal. I hope that helps. Do you know if I could make 1.5-2 times the amount in the 6 quart IP? Looking forward to making this for a baked potato bar! Do the breasts have to be thawed or can they be frozen? Hi Tammy, you can use frozen chicken breasts! 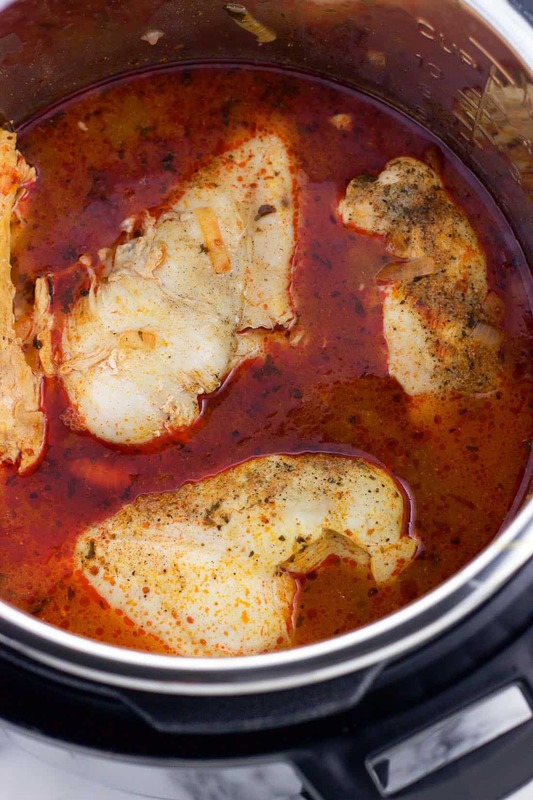 I have only used thawed with this recipe so I’m not exactly sure how much extra cook time might be required, but this looks like a great guide based on the thickness of the breasts: https://www.pressurecookingtoday.com/how-to-pressure-cook-frozen-chicken-breasts/ — especially the guideline for cooking frozen chicken breasts to shreddable. I hope that’s helpful! This Recipe was Amazing! Will definitely cook again. Hii! Do I need the apple cider vin?? Will it still come out good without it? Hi Lily! I’ve never made it without, but since it’s only 2 tbsp and the other flavors are bold, you don’t exactly need it. You can add an extra 2 tbsp of broth, buffalo sauce, or even water in place of it. Hope that’s helpful! 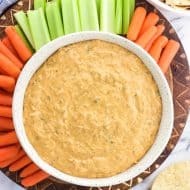 I’m fairly new to IP too, and haven’t made buffalo chicken in it yet, but I’ve definitely found the recipe to try it with! 🙂 This looks and sounds fantastic! 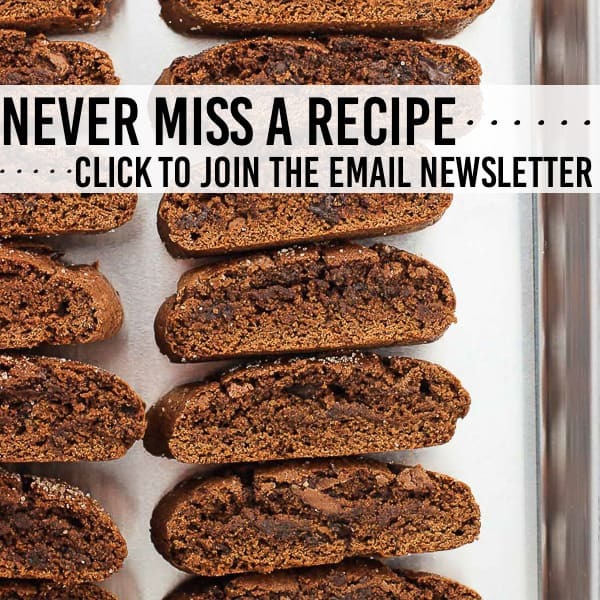 I love how quick and easy this recipe is. Perfect for busy families.